Very close to Praza de Cervantes is the Convent of San Paio de Antealtares, founded in the 10th c. and occupied since the 15th c. by cloistered Benedictine nuns. Going down the street of the same name, we come to its Portal de la Borriquita, which provides access to the convent’s revolving window. 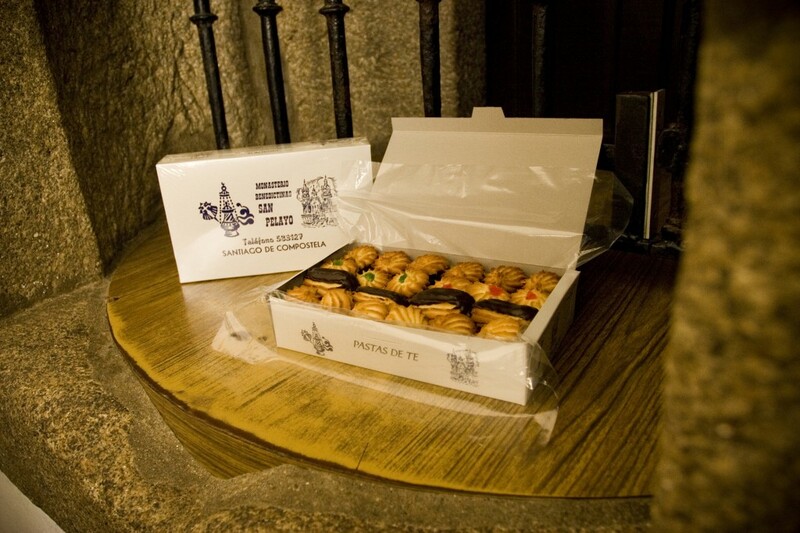 There you can buy “almendrados” (almond biscuits), “tartas de Santiago” (almond cakes), cookies and puff-pastry cakes made by the nuns. This and other religious orders were the ones that brought to Santiago, hundreds of years ago, what are now traditional desserts, namely those that, like “tarta de Santiago,” combine almonds and egg yolks. At Carnival time, the main stars of Compostela desserts are typical Galician “filloas,” crepes made in the frying pan that are eaten with sugar or honey, filled with confectioner’s custard, cream or chocolate… and in the odd bar, especially in mountainous areas, filled with chorizo, pork fat or blood sausage. Also eaten around Carnival time are “orellas,” portions of flour-and-egg pastry fried in the frying pan.